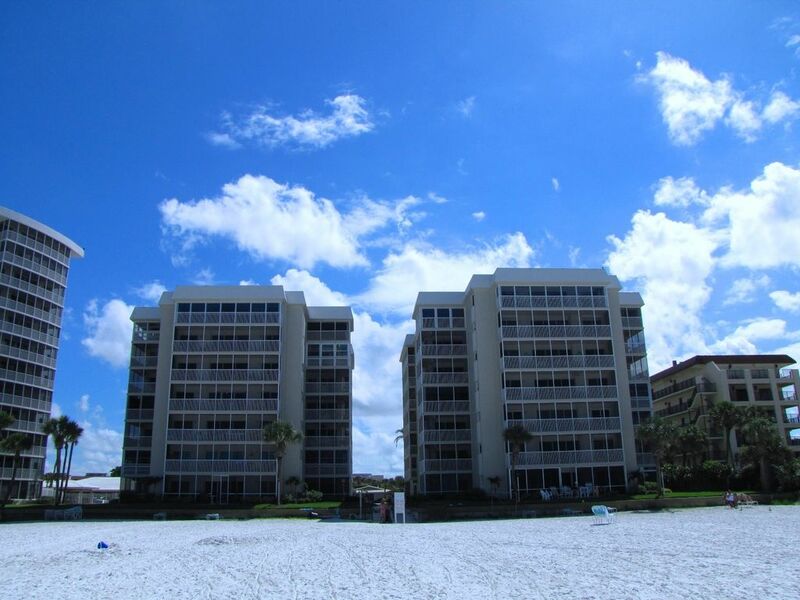 Crescent Arms Condominium Complex: Located directly on world famous Crescent Beach these Siesta Key beachfront condos are walking distance to South Village. Crescent Arms has one-story villas as well as two seven-story towers that are directly on the beach. Our vacation condos are located in the South Tower of the Crescent Arms Condo complex. Crescent Arms offers a picturesque serpentine pool that is secluded for your privacy and heated in winter for your comfort. The clubhouse, restrooms and showers are close by the pool for your convenience. The towers are steps from private beach access and lounge chairs are provided - already on the beach. It's not unusual to be able to watch dolphins swim by in the gulf. BEACHFRONT: This two bedroom/two bath Crescent Arms condo - Unit 402S - is located on the fourth floor, in the south tower. Positioned in the southwest corner it has a breathtaking view of the powder white sands and the azure waters of the Gulf of Mexico. Fully furnished and decorated, this condo feature a large living room, dining area and two large bedrooms. This condo sleeps up to 6 (king-size in Master, queen-size plus twin in the second bedroom and aerobed). The beautiful Lanai has floor to ceiling glass windows with screens. The living room has cable HD flat-panel LCD TV, DVD and CD/Stereo. An HD flat-panel LCD TV is also included in each bedroom. We've even supplied a few DVD movies and CDs. The entire unit has been renovated with beautiful plank tile flooring throughout. The fully equipped kitchen had granite countertops and tile backsplash with stainless steel microwave, dishwasher, glass top range/over, and all cooking utensils, silverware and dishes. The living room has been expanded to encompass the lanai providing a huge open space overlooking the Gulf and beach below. In addition to the leather seating and accent chair in the living room, a cozy loveseat and coffee table are placed on the lanai as well as a glass top table and chairs. The master bath has granite counters and large glassed in shower. The second bathroom has granite countertops on vanity and a tiled tub/shower combo. Sunnyside Properties provides all your linens, beach towels, and ice chests. Beach chairs are provided on the beach for your convenience. We have taken great care to supply this Siesta Key vacation rental accommodation with everything you need to make your vacation a memorable success. Attractions and amenities within walking distance include shops, fine dining, a marina, fishing charters, jet ski rentals, boat rentals, parasailing, Dolphin Tours, intimate night clubs with dancing and free lighted tennis courts. You can avail yourself of the miles of bike/jogging paths or miles of beaches to walk on and enjoy. Over 20 golf courses are within a 20 minute drive. Across the bridge on the mainland, Sarasota and the surrounding area has unmatched cultural activities. Sleep at night with the ocean surf right outside your Lanai windows! A laundry with washer / dryers is available for guest use, just down the hall. Of course the towers are serviced with elevators. Just 90 minutes from Tampa, two and a half hours from Orlando and Twenty-five minutes from Sarasota airport. Crescent Arms is on the middle of Siesta Key on Crescent Beach. The view is to the west for spectacular sunsets! Very nice facilities. Very safe w coded entry. 402s clean but needs upgrades. And new bedding. Thank you for your review although I'm not sure what to say. This unit has been updated (granite counter tops in kitchen and bath, stainless steal appliances, tile bathrooms and the mattresses are new. Mattresses are very much a matter of personal preference and always a challenge to satisfy everyone. Although the weather did not cooperate, we still had a nice time visiting with our family. We have spent many years coming to Siesta Key Beach and it never disappoints!! Come back to us! You know the weather will be better next time! Overall, our trip to Siesta Key was wonderful. The Condo was very comfortable. We enjoyed our stay. There are a few things we would suggest be addressed for future renters. The unit offers a great view of the beach. However, we were disappointed that all three of the front main windows need repair. The far left front window had red tape on it indicating it was broken. Do not open. The middle front window screen was bent. If window was left open at night, bugs would enter. The front right window did not have a screen. It would of been nice to open the windows and hear the waves. Seeing as the unit does not have an open balcony. There was dish soap provided for washing dishes by hand by no dishwasher tablets. We were also surprised Crescent Arms does not offer beach umbrellas. As many of the neighboring units do provide chairs and umbrellas. The owner provided excellent customer service. The unit was fairly clean. There is plenty to do and see in the area. We checked out the Mote Aquarium, Siesta Key Village, St. Armand's Circle, There is a wonderful shuttle running every twenty minutes which we used several times. Also, dined out at the Ole Salty Dog in Sarasota, Daiquiri Deck, and the Longhorn restaurant. Also, a friend and I purchased beautiful pendant jewelry at Silver City. Just down the block and across the street from Condo.There is nice gift store right next to the jewelry shop as well. Fortunately, the Red Tide seemed to be minimal. People are using the beaches and swimming in the water. The water color however, is still not back to normal. We had a great week in Sarasota at Siesta Key. Thank you. This was our 3rd year in this unit. We will definitely be back. You can't beat the view and the location. There's lots of space for our family of 5 to spread out and relax. There are always a few improvements and upgrades to the unit every year which we appreciate. Plus we love all the little extras like the closet full of beach toys and board games/puzzles/books/movies/video games. And Crescent Arms does a great job keeping up the grounds and the pool. We love our return guests! Thank you for the review! Very comfortable and roomy for our 4 member family. The couch was super comfy with 4 recliners. Well appointed with a closet full of board games and beach chairs, umbrellas, floats and beach toys. Close to restaurants and The Village. We really enjoyed our stay. Thank you for taking the time to leave a review. We appreciate you! Customer satisfaction is always our goal. I wish you would have called; I would have had housekeeping come back to the unit.